but I will share it at a later date because what I am sharing with you today deserves its own "sacred space" so to speak. It is beautiful and a stupendous exclamation mark for my last 10 months of stitching. Stitching is good for my soul. May it be good for your soul too! Absolutely beautiful finish Vonna. So many memories stitched into it! Stitching is certainly good for the soul. How beatiful it is! Happy Spring Break! Vonna, your ABC Sampler neighborhood is stunning. I like the frame molding you selected. As Justine said, stitching is good for the soul. Have a wonderful weekend! Love this. Hope I can find a frame that suits. It`s a great feeling to see our work finished and hung. Happy Stitching. What a tour de force this work of your hands is, Vonna. feather in your cap !!! Beautiful as always. I love seeing your stitching and your finishes. The frame you chose makes the stitching pop. It's absolutely stunning! Incredible Vonna. The frame is perfect! It is a work of art. Congratulations on a wonderful, beautiful finish! It IS GORGEOUS!!! 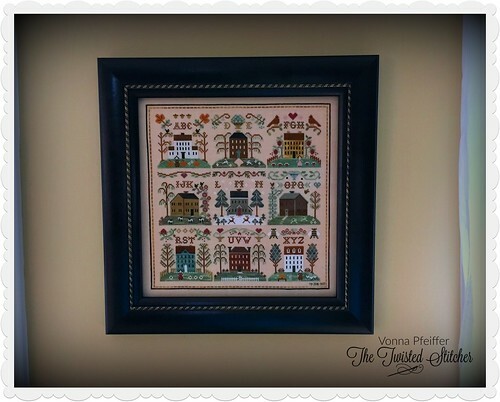 Wonderful stitching and a beautiful frame. Love it!! It's beautiful. The frame is perfect for it. Just beautiful! I have watched your project unfold over the past year and it's so nice to see your framed finish. You chose to stitch this pattern in such a perfect way...it is stunning and you are rightfully smitten! So pretty. I did mine individually and wish I had finished them in one piece now. Beautiful finish! The frame suits it perfectly! So beautiful! Love it -- and the frame is perfect! I'm sure you've inspired many, many stitchers to stitch these little cuties on one piece of fabric, Vonna! Congratulations on a true beauty of a finish (and one lovely frame, as well!). It is absolutely beautiful Vonna. The stitching and the story. It's perfect! I know you must be so happy to see it completed and on your wall. I'm a little late posting on this blog story. This is an amazing finish. The frame sure makes the stitching stand out. This is a treasure to cherish every day. Beautiful !! Your Sampler is a beautiful piece. Living in New England, I feel that you captured the essence of many towns I see here. It's really beautiful Vonna! Gorgeous work. Beautiful! You have inspired me to do this! I am a newbie and this will be my biggest piece yet. :) What size fabric do I need?? Thank you! This is so beautiful! I'm picking up cross stitch again thanks to you. I'm a fan... thank you for using your power for good!